As part of the AIA Healthy Living Tour, AIA global ambassador David Beckham was in Singapore today during the AIA Vitality Healthy Cookout Showdown to share his passion for wellness and healthy living. A former professional footballer known for his work with Manchester United, the England national team, LA Galaxy, and more, Beckham is a strong and avid believer in the value of health and wellness, and that everyone has a role to play in taking charge of their health. In a media interaction session with Human Resources, find out what he has to say about maintaining a healthy lifestyle – working out, eating well, and balancing work commitments with family time. Q As AIA’s new global ambassador and as part of the new “What’s Your Why” campaign, would you share a bit more about your motivation behind living a healthier lifestyle? I’m obviously very excited to be back here in Singapore – I love spending time here, so I never need an excuse to come back. Being an ambassador to AIA allows me to be able to spend more time here, so I’m very happy about that. With AIA, what we are doing is helping to change people’s lives for the better – to help people to live healthier, better lives, be active, do the small things because they are the things that really count at times. I think it is the important part of healthy living. Q In Singapore, when people start working, a lot of them have very sedentary lifestyles. Would you have any tips on how we can maintain a healthier lifestyle? I think that’s the difficult part. When we all have jobs and we all have busy lives and some people have children, your main focus has to be your job and your children. Sometimes, it’s difficult to find time to workout, to keep fit, to eat healthy – because especially when you travel, you have to really work hard at finding a way to eat healthy and eat well. I think the small things are the things that really make a difference. Such as, instead of driving to work, walk to work; instead of driving to lunch, walk to lunch. It’s sometimes the small things that really make a difference. Even with the kids – walking them to school or when we spend time over the weekends, we’re riding bikes. Sometimes, it’s really those small things that matter. Q Everybody is very interested in how you start your day, what is your morning like and what is it that gets you through the day and how do you motivate yourself to keep doing it? I have four children and I’m very lucky to be able to spend most of my time at home. One of the main things that I am able to do is to take my kids to school most mornings whereas most parents might not have the opportunity – at times, I don’t too, because I travel for work. My day when I’m at home is to wake up at a quarter to seven, wake the children up, make them breakfast, get them ready for school, and take them to school. Then I workout and grab some breakfast – at times that is anything that the kids have left over. I’ll then go to the office, do some work, and I’m ready to pick my children up again. Most of my day is centered around the children, because when I do travel, it’s very difficult to be away from them, so when I am at home, I’m there with them. I think the small things are the things that really make a difference. Such as, instead of driving to work, walk to work; instead of driving to lunch, walk to lunch. Q Is there a workout regime that you’ve picked up from your football days that you still do today and why? There isn’t really one. When you’re a professional athlete, you’re so regimented in what you do, how you workout and what you eat. When you finish, it’s a different thing. You have to find something that you love doing, something that keeps your mind interested. I love to cycle – I do a lot of indoor cycling; I do boxing from time to time – I don’t like to get hit of course so I try to avoid that. But I like to box, I like to cycle, and from time to time I like to run. Q Is there anything that you particularly dislike when it comes to workouts and how do you get around it? How do you motivate yourself to do it? There’s nothing I really dislike about working out. I’ve never really done a lot of weights, it’s something that is good from time to time, but for myself, it doesn’t suit my body type. It’s something I’ve never done even when I was playing. But I don’t dislike it. I like to workout in general so there’s nothing I really dislike. Q Talking about Singaporeans’ favourite topic – food – which do you think is better? Healthy diet or exercise? What are your thoughts about how being healthy is more than just losing weight. I think they are both just as important. It doesn’t have to be expensive or time consuming like going to the gym and things like that. It can just be going for a walk or going for a bike ride. Diet is also important. It’s important to eat healthy in the morning, afternoon, evening, and even during snack time – it’s always important to eat the right things. We don’t always eat the right things, and that’s ok. It’s actually ok to have those moments where you eat those things you shouldn’t. But healthy eating is something that is very important in, especially when you get older and live your lives. Q How has your diet changed ever since you’ve stopped playing professionally? Not that much really. It has changed slightly because when I was playing, every time we travel somewhere, we had to eat the same thing. We couldn’t have a glass of wine from time to time, because that kind of thing was frowned upon. Since I’ve stopped playing, I’m able to have a glass of wine on a Friday night or Saturday, when I’ve never done that before. Things have changed slightly, but I’ve always tried to eat the right things and drink the right things. That’s the way I’ve always lived my life so nothing has really changed in that sense. It’s important to eat healthy in the morning, afternoon, evening, and even during snack time – it’s always important to eat the right things. Q What’s one dish that always works at the Beckham dinner table? And can it be something that is healthy, the kids love, and is easy to make in 30 minutes? The kids do love to eat salad – believe it or not, that’s true. Even Harper who is 7 loves salad. Cruz in particular, loves iceberg lettuce with balsamic vinegar – of course, healthy balsamic vinegar. It’s something that the kids love and we’re very lucky with. The one thing that I would say isn’t too healthy is pasta. They love spaghetti bolognese – it’s something they love every time I make it. Q Any final words about the cookout or to say to Singaporeans about living healthier? I’m definitely looking forward to the cookout. I’m looking forward to find different ways of making traditional delicacies in a healthier way. We found out in Hong Kong with the mooncakes, we found out about the healthy meatballs in Korea yesterday and now we’re going to find out about how to make traditional Singaporean dishes healthily (think Chili Crab, Roti Jala, Nasi Lemak, Laksa, and Hokkien Noodles). To all my fans in Singapore, I just want to say thank you for all your support. It’s amazing to still visit the places I’ve been to when I played with the teams that I have been with and still get the same welcome. It’s why I keep coming back and it’s why I keep coming back to places in Asia. Singapore is one of my favourites so I’m glad that I keep coming back. Earlier this month, AIA Group Limited, formally launched its partnership with David Beckham through a major new campaign in the Asia-Pacific region, “What’s Your Why?”, that reflects the commitment of both parties to helping people live longer, healthier, better lives. In March 2017, AIA entered a multi-year agreement for David Beckham to become the Company’s Global Ambassador. 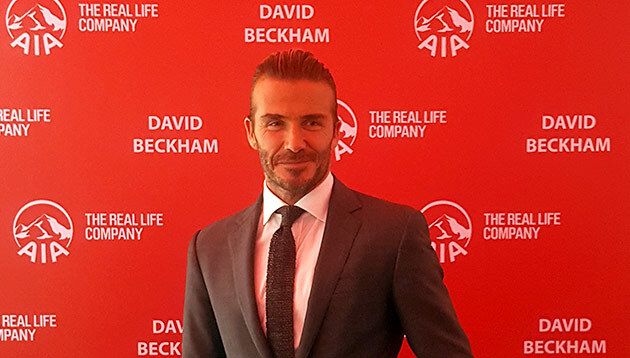 In this newly created role Beckham will be present at a number of AIA’s most important community and business activities to personify and demonstrate the benefits and the importance of maintaining a healthy lifestyle. 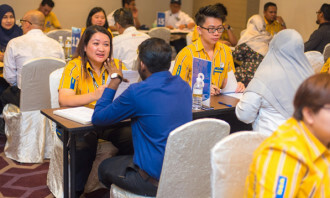 With a growing team of team of four, the hospitality expert speaks to Human Resources on the adventure that awaits in his role. .. According to these workers, their bosses have asked them to help out with some pretty weird non work-related stuff. .. 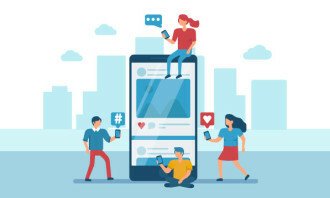 If you’re struggling to get staff motivated about training programmes, it’s likely your strategy is missing key engagement element..